Hindi is a product of the Hindustani language. It is among the official language of India and it is widely spoken in the country. Globally, it is ranked as one of the top four most spoken languages by virtue of its native speakers. The world has become a global village and immigration has pushed numerous languages to spread to various regions. Consequently, this has altered the essence of diverse dialects to suit the area where individuals have migrated to. The language’s roots emanate from the Sanskrit language. This was the earliest dialect spoken by the Aryan settlers who first settled in the north-west locale of India. The language is rooted in Indo-European dialects. Its earliest forms include Old Hindi, Vedic Sanskrit, Sauraseni Prakrit, Classical Sanskrit, and Sauraseni Apabhramsa. This article will give you tips on how to learn Hindi wordsquickly and efficiently. In addition to this, it will also educate you more about the Hindi language in general. The Hindi language is one of the difficult dialects to learn. It is often compared to the Urdu language. Therefore, if you know how to speak Hindi then you will automatically recognize the Urdu language in any setting. The major difference between these two Asian languages lies in the way they are written. Hindi is written in the Devanagari script and Devanagari Braille. This script includes 33 consonants and 11 vowels. Moreover, Hindi is expressed from left to right in the written form. On the other hand, the written version of Urdu is done in the Perso-Arabic script and it utilizes Persian and Arabic words. Other languages which are similar to Hindi include Punjabi and Lahnda. Notwithstanding, the Hindi language is not India’s only official language. The Asian country has 21 other official languages. These include Nepali, Punjabi, Urdu, Tamil, Sanskrit, Bengali, Konkani, Bodo, Kashmiri, Gujarati, Sindhi, Oriya, Santhali, Kannada, Dogri, Assamese, Maithili, Telugu, Malayalam, Marathi, and Manipuri. However, Hindi, Bengali, and Telugu are the top three indigenous languages spoken in India. Additionally, English is also considered as an official language in the country and it is widely spoken in the Asian country. Apart from India, the Hindi language can also be spoken in Fiji as Fiji Hindi, Caribbean Hindustani which is spoken in Suriname, Nepal, Mauritius, South Africa, Trinidad and Tobago, Dubai, Singapore, and Guyana among many other countries. However, there are several resources to assist any individual who is willing to learn the Hindi language. These resources include Rocket Languages which offers audio lessons for free. These classes are available online. Therefore, they are versatile and efficient. Rocket Hindi includes normal everyday words that are used in conversations. The words are realistic and they also include whole phrases that express positions that any human being may face daily. In addition to this, the free online audio lessons also include reinforcement tools which develop the retention power and knowledge advancement of the learner. Furthermore, they include various packages to boost your Hindi learning experience. They include a writing package which allows you to listen and write what the audio is stating. This will automatically assist the learner in writing the Hindi language proficiently. However, you have to ensure that the keyboard is set to Hindi. This is because the language includes special characters that don’t exist in the ordinary English keyboard. Moreover, the online free audio classes also include the Know it package. This basically allows the learner to perform simple translations from English to Hindi. Additionally, you get to read the phrases and words and to record yourself while recounting it in the dialect. This package also provides the learner with a voice recognition resource to allow them to perfect their pronunciations. Rocket Hindi provides the learner with a Nikita seven day mini-course. The mini-course which is dubbed learn Hindi fast is usually sent via email. The Rocket Hindi free online course has gotten raging reviews from previous clients. This course has an impressive 4.7 stars average rating. Nonetheless, it can also be downloaded for easier offline learning. The online language lessons are provided by professional tutors called Nikita, Erica, and Rohan, who are realistic and skilled in their approach to teaching the Indian language. The Rocket Hindi online course has received various awards due to their expertise. They include the Consumer Award. Apart from the Hindi language, this learning resource also has many other online courses to teach its learners other languages. Other online resources which will assist you with learning the Hindi language fast include Duolingo. This online resource is also free and based on science. 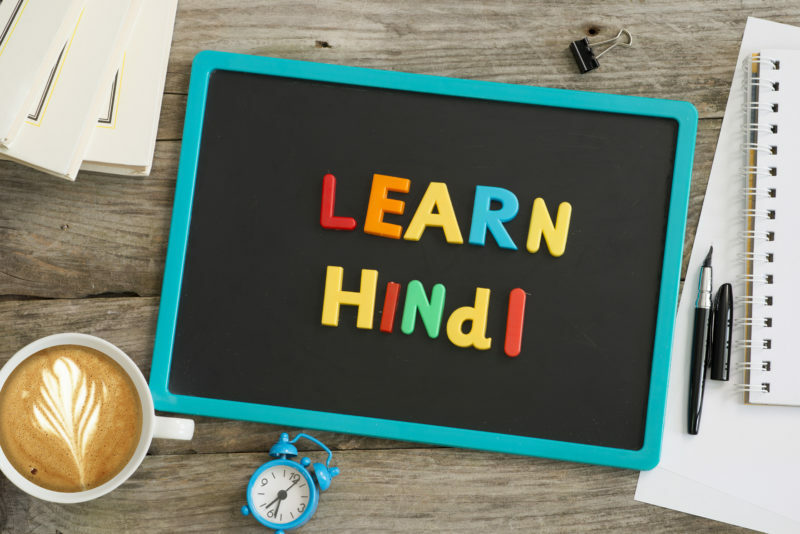 There are various other online resources, books, magazines, newspapers, and other publications that can assist you in learning Hindi. You can also download various apps that will assist you in learning Hindi. India’s Bollywood movie industry is known all over the world for the amazing movies it produces. In addition, practically all the movies are acted in Hindi with hints of other languages spoken in India, English, French, and other popular world languages. This entertainment vehicle is a valuable resource in propagating the Indian language to the world. This is due to the fact that Bollywood movies are enjoyed and consumed globally. Therefore, if you are trying to learn Hindi, Bollywood movies should be among your favorite entertainment channels. Moreover, most of these movies include subtitles which can assist you in instant translating. In addition, they will also aid you in digging deeper into knowing Hindi words in the context that they may be used. A conversation with someone who is familiar with the Hindi language is perhaps one of the best ways of learning this dialect. This is because it supports you in comprehension and understanding the language. In addition, it will also assist you in pronouncing the words perfectly since the other person will guide you while speaking. If you are living near Hindi speakers, strive to listen to them conversing in a natural setting, you will get to grasp so many of the language’s nuances in this perspective. Learners of any language should always remember that you cannot grasp a language fully if you can’t pronounce the major words effectively. Acquiring audio books which include fiction and other genres will also go a long way in ensuring that you learn Hindi words successfully. Make sure that you note some of the keywords that you learn daily for the purpose of retention. It is useless listening to the audiobooks if you can’t grasp and remember the words later.